L'adattatore 1132 provvede un semplice interfacciamento ai sensori che forniscono un'uscita in corrente (4-20mA). Questa scheda provvede all'alimentazione del sensore, misura il flusso di corrente e lo converte in tensione per poter essere facilmente utilizzato, ad esempio come "SensorValue" da una Phidget Interface Board. The 4-20mASensors can be connected to and powered by the provided terminals on the 4-20mA Adapter board. 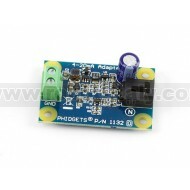 The 1132 will measure the current passing through the attached sensor and convert it to a voltage, where it can be displayed as a SensorValue by a Phidget Interface board. 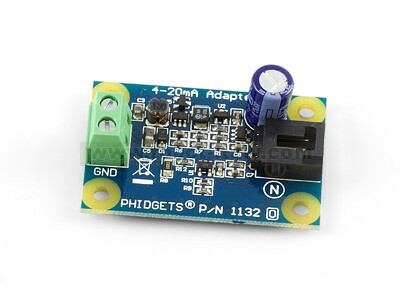 The 4-20 mA Adapter board internally produces +15V from the Phidget InterfaceKit’s input analog voltages which is used to power the connected sensor, eliminating the need for an external power supply.